On July 16, Mumbai Mirror had published an article about Sanjay Goel's efforts to bring his mother Dr Asha Goel's killers to book. Since then, 3,150 people have signed the petition (pleading with the Canadian government to pressurise the Indian government into doing something about the case) and 80 people have e-mailed Sanjay sending condolences and sympathy messages. REGINA - There are still more questions than answers in the brutal killing of a former Regina doctor, family members say. An obstetrician and gynecologist, Asha Goel delivered thousands of babies in her 20-year career in Saskatchewan and her 17-year career in Ontario. 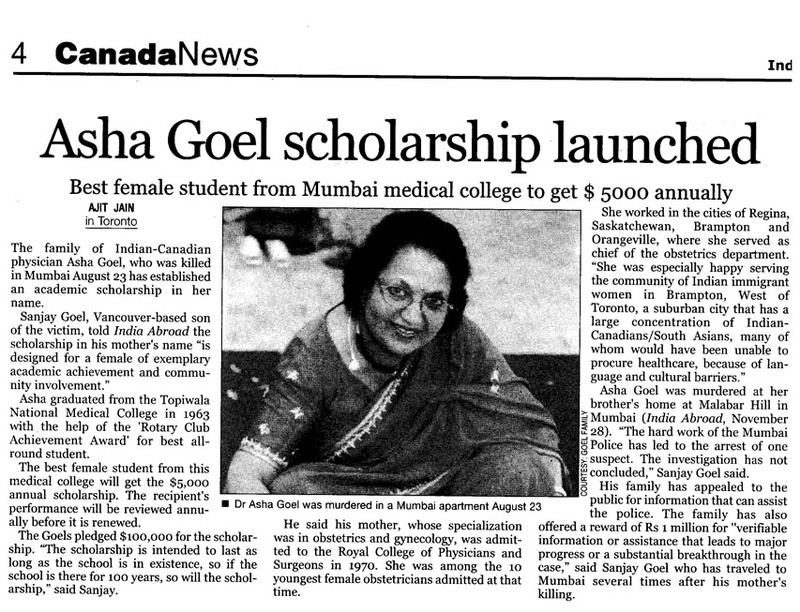 The Case of Dr. Asha Goel was murdered in India in August 2003. Colin spoke to Dr. Goel's son and daughter about the case. More than 100 days after the Ontario obstetrician's vicious murder in India, her killers have yet to be caught. Pradeep Parab, the only person picked up in the brutal murder of Dr Asha Goel at Sudhar building in Malabar Hill on August 23, has now named her brother Sureshchandra Agarwal as chief conspirator in the case. Even the confession of the killer isn’t enough for Malabar Hill police to initiate action against the mastermind of the murder of a 62-year-old NRI in August. On August 24, Dr Asha Goel was found in a pool of blood by a maidservant in her Sudhakar Co-operative Housing Society flat at Dhabolkar Marg, Malabar Hill. After investigations, police arrested Pradeep Parab, a friend of one of the maidservants. Asha GOEL was a vibrant member of the many communities to which she belonged. She was a respected and accomplished obstetrician/gynecologist in Regina, Saskatchewan (1971-1987), Brampton, Ontario (2001- 2003), and Orangeville, Ontario (1987-2003) where she was chief of the Obstetrics Department. ORANGEVILLE - An Orangeville obstetrician, Dr. Asha Goel, 62, was murdered over the weekend while visiting her elderly brother and his wife in Mumbai, India. The son of a Canadian obstetrician who was beaten to death in India last weekend is calling on the Canadian government to take a greater role in the search for her killers. Mumbai, August 24: Security has been tightened in a housing society at Malabar Hill after a 62-year-old non-resident Indian doctor was found murdered in her brother’s flat on Saturday. A non-resident Indian was found murdered on the 14th floor of Sudhakar Building in Malabar Hill, Mumbai, on Saturday.